Save the Date for the 13th Annual DRYerson Festival! Spend the afternoon with the Center for Coalfield Justice and your neighbors and friends as we celebrate the progress we’ve made in our fight to protect Ryerson Station State Park. The 13th annual DRYerson Festival will be held on Saturday, June 22nd from 1-4 PM at Pavilion 2 in the Park. This year’s celebration will feature live music from Bree Otto (you loved her last year, and so she’s back), games (with prizes), a soaking-wet-sponge toss (all the fun of water balloons with no waste), and other fun surprises! The festival is pet-friendly, and our staff highly encourages you to bring your pooch on a leash (or a cat if your cat will let you put a leash on him/her) to join in on the festivities! Summer classics like hot dogs, pasta salad, and watermelon will be offered throughout the day, but this year we’ll also be serving summertime fun in the form of snow cones and cotton candy. Again this year, in order to speak to our values and support another one of our campaigns, we will limit our use of plastic, so we will have reusable plates, cups, and utensils provided by Our Children Our Earth: Toys, Silks, and Eco-Goods. Worried that you’ll only be able to make it for a brief time? Fear not - we’ll have door prize drawings throughout the Festival for everyone who checks in at the registration table! Let us know you are coming to event by registering here. Call us at the office (724-229-3550) if you want to volunteer or want to know more about the event! We hope to see all your friendly faces there! 12th Annual DRYerson Festival a Huge Success! 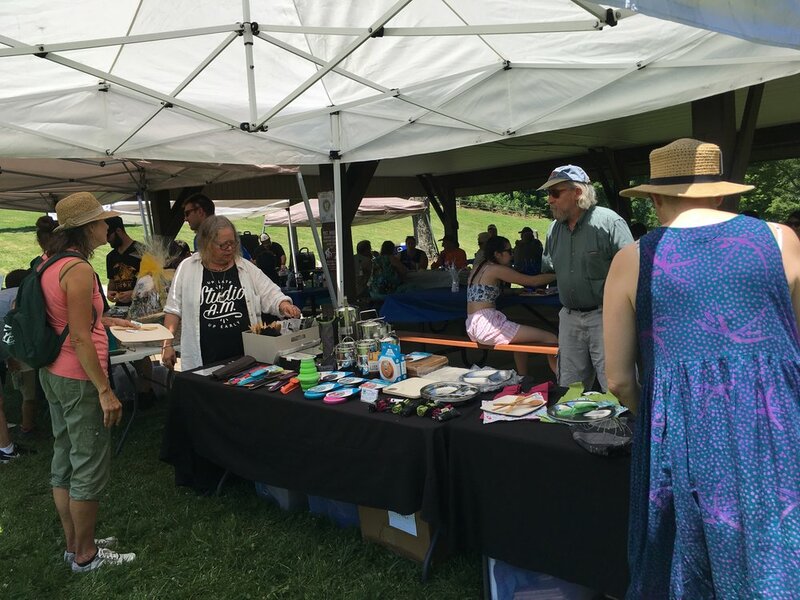 We celebrated our 12th Annual DRYerson Festival on Saturday, June 30, 2018 at Ryerson Station State Park. It was a hot day, but that did not prevent over 60 people from joining us for the afternoon, celebrating a place we love. Our day began with a pre-Festival hike, thanks to our friends at the Sierra Club, which allowed participants to see the places we have worked to protect throughout the years. Over the course of the day, we heard music from Bree Otto, a local musician from Adah, PA, who played an acoustic set of popular songs across a variety of genres. Follow her on social media to see where she’s playing next! While she played, representatives from DCNR were a short stroll away in a separate pavilion, showcasing plans for updates to Ryerson Station State Park, answering questions, and taking input directly from the community. Many people took advantage of Our Children Our Earth’s presence at the Festival: they were selling environmentally-friendly, plastic-free goods, like portable utensil sets that are designed to replace single-use plastic ones at ballparks or music festivals or concerts. They also provided all of the bamboo plates and utensils that were used at the DRYerson Festival as part of their “Plates To Go” service: they rent out their plates and handle the cleanup so that we can avoid wasteful, unnecessary plastic. This is something CCJ will continue to do at our events, and we hope this will inspire others - individuals and organizations - to make whatever changes they can so that we can collectively live our values. A brief word of thanks is insufficient to address the hard work that so many contributed to this event: CCJ staff and board could not have held such a successful event without the help of our volunteers. We also greatly appreciate the support from our sponsors , Sierra Club, National Resources Defense Council (NRDC), Pittsburgh United, One Pennsylvania, Mountain Watershed Association, Harry Enstrom Chapter of the Izaak Walton League, Monongahela Friends Group, Conservation Voters of PA, and Center for Popular Democracy. Come spend the afternoon with the Center for Coalfield Justice and your neighbors as we celebrate the progress we’ve made in our fight to protect Ryerson Station State Park. The 12th annual DRYerson Festival is on Saturday, June 30th from 1-4 PM at Pavilion 3 in the Park. The day will kick off at 11:30 with a pre-festival hike lead by CCJ Director ,Veronica Coptis, covering the history of the impacts to the park and our community’s efforts to hold Consol accountable, protect our water resources from further damage, and re-envision an improved park. Register here for the hike and don’t worry: it ends just in time join the festival! This year’s celebration will feature live music from Breanna Otto, coloring contests, kids crafts, and back by popular demand- the CCJ water balloon blast! The hike and the festival are dog-friendly, and our staff highly encourages you to bring your pooch (on a leash!) to join in on the festivities! Cats on a leash are also welcome - we don’t discriminate at CCJ. Summer classics like hot dogs, ham barbecue, and watermelon will be offered throughout the day, and you’ll have chances to win door prizes at the top of every hour. One change for this year’s event that speaks to our values and supports another program of ours is to reduce our use of plastic, so we will have reusable plate and each person will get to take home a bamboo fork. Ryerson is going through a revitalization process to improve the park, and DCNR will be at the festival to share the status on the current progress and get feedback from you. CCJ is committed to ensuring that these changes will incorporate the needs of our community. Don’t miss this opportunity to engage directly with DCNR and celebrate the park. Let us know you are coming to event by registering here. Call us at the office if you want to volunteer or want to know more about the event. We hope to see all your friendly faces there! The 11th Annual DRYerson Festival was a huge success. Over 60 people came together to celebrate Ryerson Station State Park and took action to protect our streams in and around the park. Being here at Ryerson with all of you is so powerful to me. It is impossible to put into words the influence these majestic hills and forests have had on me. I grew up here as I’m sure so did many of you. Most major memories in my life have something that ties back to the park, our streams, and what used to be our lake. That is why it means the world to me and the Center for Coalfield Justice that you took time today to make it clear that our community will fight back against the many attacks on our park right now. Over the decade we have built public pressure and held Consol accountable to the law, and we have been winning. This past winter, when Governor Tom Wolf sided with Consol and issued yet another permit despite the fact that it was predicted our streams would be dewatered, we stood up and said no. Our amazing attorney, Sarah Winner, quickly filed an appeal and a supersedeas, which means asking the judge to halt operations while the legal case proceeds because the stream would suffer damage that could be permanent. Mike Becher and Susan Waldie from Appalachian Mountain Advocates joined our legal team shortly before the hearing in January. We WON because of the hard work of our legal team and the support from all of you. We are still waiting for the final decision from the Environmental Hearing Board judges, but make sure to sign in so you don’t miss any updates. As they’ve made clear, taking our lake, taking our streams, is not enough for Consol. They have applied for more permits to mine under more streams in the park. We need your help to show the Department of Environmental Protection and Governor Wolf that this time they should be on the right side, with the community, and deny these permits. Because we are winning, the coal industry is pushing back. They are lobbying for Senate Bill 624, which attempts to exempt the longwall coal mining industry from the Clean Streams Law. SB 624 was passed in the Senate along party lines and is in the House of Representatives. It is crucial today that we send a clear message to Governor Tom Wolf that it is time he stand with environmental justice communities and not coal companies. We need the Governor to veto this unconstitutional legislation, and we encourage all of you to record a video message that I will be delivering to his staff in person on Monday in Harrisburg. Our volunteer, Eva, will be recording your messages over by the canoe, so stop over to see her before you leave today. I am honored to serve you all and make our concerns heard in Harrisburg but I can’t do it alone. The fight to protect this park is going to be a long one, but together I know that I will be sitting by the iron bridge one day teaching my daughter how to fish like my dad did with me. At the same time that we are working so diligently to protect the park from more harm, the Ryerson Task Force is working hard to rebuild a place where memories can be made again. The design work for the new pool almost completed and feasibility studies are being done for restoring the stream in through the dry lake bed. But all of the money that has been set aside for restoring Ryerson will be wasted if we don’t have any water left in the park. So, if you haven’t already today, take action by recording a video, signing up to receive emails from us so you can sign petitions, and just talking to your neighbors about what we want for our towns. Over fifteen people recorded video messages to Governor Tom Wolf about what Ryerson Station State Park means to them and why protecting the park is so important. There can be no doubt that people are dedicated to the fight for Ryerson are going do what it takes to protect it. Thank you to everyone that supported and attended this year’s DRYerson Festival! WIND RIDGE – The Center for Coalfield Justice will host its 11th annual DRYerson Festival Saturday as it continues to look toward a new vision for Ryerson Station State Park in Greene County. This yearly picnic, which will run from 1 to 4 p.m. at Pavilion No. 1, will harken back to the fun families enjoyed at the 1,164-acre state park before Duke Lake was drained in 2005 after undermining near the area damaged the lake’s concrete dam. The park opened in 1960, with the lake being an integral attraction, CCJ executive director Veronica Coptis said, but now the group is working to save the remaining springs and streams from further damage from longwall mining. “Our community has been coming together for more than 10 years, and it’s becoming clear that we are winning,” Coptis said. For more than two decades, the Center for Coalfield Justice has been involved in the protection of Ryerson Station State Park. We commented on the initial permit for longwall mining under the park, ensured that Consol Energy was held accountable for damaging the dam and destroying Duke Lake back in 2005, and we advocated with the community to protect the park. To this day, we work toward the protection of streams within Ryerson in an effort to preserve the communal and economic opportunities in the park. This fight has led CCJ to Harrisburg four times to meet with legislators, to talk with the governor’s staff, and to provide public comments on the status of the permit to longwall mine underneath the park. We’ve been outspoken opponents of bills like SB 624, which would cause further damage to streams in the park. The Secretary of the Department of Environmental Protection, the Secretary of the Department of Conservation and Natural Resources and the Governor’s staff even visited Ryerson in March and saw the impacts to our streams and park firsthand. It has also led us to the courtroom, where we challenged the current permit issued in December - a challenge that led to an extraordinary legal victory against Consol Energy. Since this supersedeas was issued, CCJ has been the topic of various billboard ads and other elements of a smear campaign orchestrated by industry front groups, but we move forward. Why keep moving forward? Within Greene County, there are not many places to recreate, hold events, or spend time in nature - Ryerson is the one place where you can do all three. This is why we hold DRYerson: to celebrate the park, to remember the hard work we have put in, and to come together to move ahead with the future we envision for the park. This year, the DRYerson Festival will take place on Saturday, June 24th, 2017 from 1:00 PM to 4:00 PM. We will have live music, food, and games for kids and adults, all for free. We will also have a raffle basket table where you can buy tickets for the chance of winning an item, a registration table for long standing members to check in and new members to join us, and event t-shirts. We encourage members to bring friends, relatives, and dogs (on a leash, please). As the day goes on, we’d love to hear from you about why Ryerson is important to you and what you’d like to see happening in the park in the future: because it is a state park, it is our park, and it should reflect our community. For those of you who would like to be more involved in the event, there are plenty of opportunities to volunteer. From now until the festival, we will be seeking out and accepting donations of items for the raffle baskets, so let us know if you have something to donate. Most help, however, will be needed on the day of the event, from setting everything up to serving food to ensuring we leave behind no mess at the end. If you are interested in volunteering some time, please email our community organizer, Sarah Martik, at smartik@gmail.com or call 724-229-3550. Regardless of whether you want to donate time or enjoy the day, be sure to join us for the DRYerson Festival. Land and water have inherent value, and we need to remember to celebrate and protect those values all the time.